Natures Aid Organic Wheatgrass is organically grown and harvested when the leaves are still young to obtain the optimum level of nutrients from its leaves. Wheatgrass is an excellent source of chlorophyll, fibre, amino acids, antioxidants, vitamins and minerals. It is also known for its detoxifying and cleansing properties. 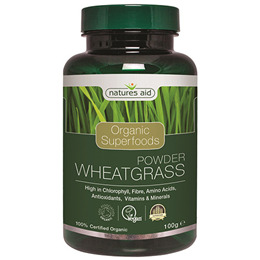 Below are reviews of Natures Aid Organic Wheatgrass Superfood Powder - 100g by bodykind customers. If you have tried this product we'd love to hear what you think so please leave a review.